Newark Post readers have voted Eddie Michelson of the Courtyard University of Delaware the city’s Best Bartender! This is the second consecutive award for Eddie, and both the Courtyard University of Delaware and Shaner Hotels could not be more proud! Eddie was part of the opening team of the Courtyard University of Delaware in 2004, and has been with the property since its beginning. He was born and raised in Brooklyn, NY where he began bartending before his relocation to Newark, Delaware. 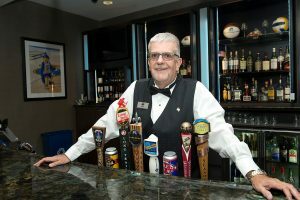 Eddie has been bartending for over 25 years, and truly enjoys the interaction he gets to have on a daily basis with hotel guests. Eddie also relishes the challenge of holding himself and the service he provides up to the high standard expected by guests of Marriott properties. Please join us in thanking Eddie for his continued commitment to customer service and leaving a lasting impression on all that sit down at his bar. Yay Eddie!!! 2 yrs in a row! And I still agree! it was a pleasure meeting you last year 🙂 Congrats!! 2 years in a row, quite an accomplishment Eddie! Way to go!! Congratulations! I think they need to name a drink after you! I love seeing this again! Great job and congratulations Eddie and the entire Newark team! Congrats Eddie! Glad we have you as part of Shaner!